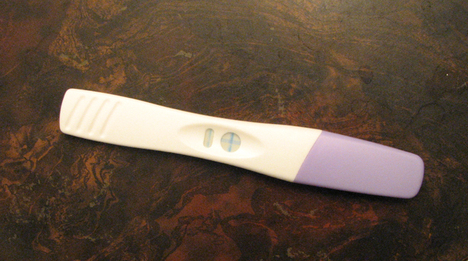 I told myself it didn't matter, not having a positive pregnancy test. A blood prick from the doctor's office is way more telling than a first morning's urine, and the last thing I need to do is waste three-fifty on something that offers redundant information. But tonight I asked Luke to pick up a Target-brand HPT, anyway, frugality be damned, because I am a girl and biologically programmed to pee on sticks. I need proof. I need the two pink lines. Or in this case, a big blue plus sign. Congratulations, pregnant self! Call me crazy, but it's much more real now. Things have been crazy-busy around here. Last Wednesday, Luke and I lost two hours of married life talking numbers with our mortgage lender and visited seven homes in four hours on Sunday. Today we saw three more plus the most promising one from the weekend, and tomorrow we will make an offer. House hunting has proven to be one of the most interesting experiences of my life, and the most exhausting, especially when you're schlepping around a six-month-old who will only tolerate so much car seat before her screams permeate a twenty-foot radius. One house had a whole room showcasing African safari decor complete with elephant wallpaper border and an unfortunately persistent smell of cat. We also attempted to see two bank-owned homes listed at to-die-for prices, until we actually entered the homes and realized that's probably what happened. Somebody must have died. What else could explain the torn carpet, scribbled-on walls, damaged fences, and bugs seeping through the woodwork? If Luke and I could afford a more mature down payment and about ten thousand dollars worth of up-front maintenance costs, these bad boys would be a steal. But we have babies (babies! MY GOD), who would prefer to eat more than once a day, and I am not a fan of having to purge questionable living creatures from my happy place. The house we are going with, our first choice, is adorable. Three bedrooms, two baths, roomy, fenced-in backyard, two-car insulated garage, brand-new carpet, appliances included, and closet space galore, all in a neighorhood with one of the best school systems in the Indianapolis area. Originally we were hoping to score four bedrooms, or at least three beds and an office space, but alas, we are first-time home-buyers living on one salary, so some of those wants will have to wait until next time. First Choice will definitely meet our needs as a soon-to-be four-person family for years to come, and today on our second walk-through, I got lost thinking about raising our children there--rocking them to sleep, setting up a Christmas tree, playing tag in the yard while Luke throws hot dogs on the grill--and now I am quietly freaking out because I am too emotionally invested in this transaction. We have a price cap that we will not (cannot) negotiate, and there are two other houses to act on should this deal fall through, so I'm not worried about losing my head, but if for some reason things didn't work out, I just might pull a Sally Field circa Steel Magnolias ("I wanna know whyyyyyyyy") and consume an entire pint of Chunky Monkey in one sitting. Which may or may not be appreciated by my embryo. Kara is fabulous. She's been sitting on her own for months now, but yesterday was the first time she actually pulled herself into a sitting position. That made me cry, too, as did thinking about how huge I'm going to be in a few months and I won't be able to hold her on my chest like I do now and wah wah wah more ice cream please. It's getting harder and harder to keep my lips zipped about baby number two at work. I've already told my VP, my direct supervisor, two of my work buddies, and our sales and marketing analyst. If I can make it to my June 18th ob/gyn appointment and ultrasound without tipping off the CEO, it will be a bloody miracle. And seeing as life lately is already one big miracle, I doubt I'm due for another. The good life is moving ahead. House hunting is good. 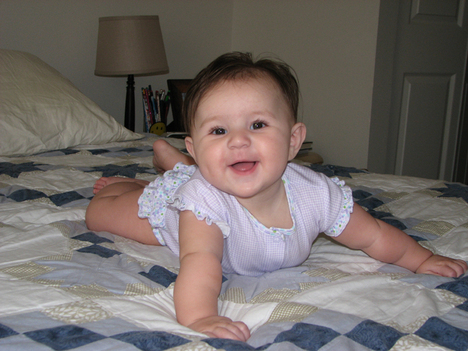 Babies are good. Everything is good. I never had much luck with Hpt's either. With my first, I never got a positive home reading until I was almost 10 weeks. And having two babies will be fabulous, and wonderful, and you'll know all the things that are okay. You won't stress as much, and you'll give yourself more of a break with things. And sorry if my "it will be hard, blah, blah, blah" comment a couple of posts ago was rude. Totally wasn't trying to be harsh...just real. I am really happy for you both. I think having more room and the yard will make a giant difference. Little Kara will be out playing in the grass and with her toys.And just think, you will have a set due date instead of the long wait. I am guessing they will try not to let this baby get so big. My daughter was told that her next baby will be coming 2 weeks early to avoid the big baby trauma she went through. I think Kara looks alot like one of your sisters but I don't know her name. She's such a sweet baby. They still like to cuddle even as toddlers. Not as frequently of course, but that just makes it all the sweeter. The house sounds wonderful!! Good luck. Crossing my fingers for you that you get your house! My husband and I will be buying a house in about a year, and I know I'll have those same thoughts of children in the yard and him grilling out back as you do. I really can't wait. P.S. Love the Steel Magnolias reference!! Wow, what an exciting time! I hope you get the house. Good luck. I'm glad you guys found a couple houses you like so fast. Well, it seems like it's fast from this end. While house hunting for our current house, we too looked at some forclosed properties, and were HORRIFIED at the condition of them. But the pricce... oh the price! Good luck with the offer you're making on your first choice! I hope you get it! Good luck with the house offer! I almost threw up at work waiting to hear back about the counter-offer, etc. Very nerve-wracking, but very worth it. I still can't get over that you're pregnant again. You will have two babies before I even have one, and we married within two weeks of each other! Crazy how fast things can change - or not, in my case. I'm so excited for you guys with the house! I know this is something you've been dreaming about for a long time now. Can't wait to see pics of the place you guys settle on. I will cross my fingers for you! I am so happy for you guys. Things are working out wonderfully for all of you! Wow! Great news about the house...I started salivating at the "2 bathrooms" part since we have a 3 bedroom 1 bathroom house and it's definitely not enough. Congratulations! And good luck with your house-hunting. Isn't it so much fun? After all the schleping around, eventually you'll come to that ONE that is "the one". I hope you find it sooner rather than later, cause schleping around whilst 8 months pregnant is hard work. Oh, wow, buying a house is always terrifying and exciting at the same time! good luck! Oh, darlin'. I'm so happy for you. I remember looking at those "cat-stank" houses. And yes, people are destroying their homes before the bank evicts them. Sad, isn't it? I'm glad you found one that suits. And with others as back-up, you, are, indeed, looking at some miracle times in your life. Looking at houses is hard work. I did the same thing you did...I would picture us living in one of the houses. I would assign each (unborn) kid to a room. And then name the (unborn) children. And then I'd wonder why my heart would break anytime an offer didn't go through. Sounds like you guys are doing your homework. That's awesome. Good luck and, as always, keep us posted. Congratulations! pregnant self, indeed. Very awesome.